A sealant is a plastic material that is bonded onto the chewing surfaces of the back teeth. The sealant acts as a barrier protecting this part of the tooth from decay-causing bacterial plaque. When are sealants necessary? Depressions and grooves form in the enamel of the back teeth as they develop. When these fissures are deep they are difficult to clean and keep free of plaque. A sealant is a very effective plaque barrier. Unfortunately this material is not effective on the smooth surfaces of the teeth, which encompass the rest of the visible tooth structure. These surfaces can be kept free of plaque by good brushing and flossing habits. 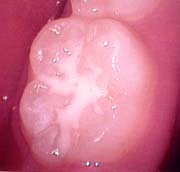 Who should have sealants placed? The greatest benefits of sealants are their application in children soon after the erruption of a tooth that is a candidate for sealant application. How are sealants applied? The teeth are cleaned with an abrasive to remove all the plaque, then they are dried and isolated to keep them free of moisture. A material is placed on the teeth to allow the sealant to bond and adhere to the tooth. The sealant is then placed on the tooth and bonded to place with a high intensity white light. Do sealants need to be reapplied? When the sealant is applied, finger-like strands of material penetrate the tooth enamel. The protective action of these filaments lasts long after the material has worn off the tooth. It might be neccessary to reapply the material at some time, but very often the child is older and the more decay-prone years have passed by the time the sealant has worn off. On the left is the tooth before the application of the sealant. 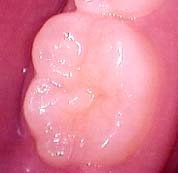 The deep grooves on the biting surface of this tooth are susceptible to decay. On the right the grooves have been sealed, preventing plaque from adhering to areas of the tooth that are difficult to keep clean.